So last week, I saw on SokoBeauty's insta page that she's doing a collab with Starskin beauty on sheet masks! 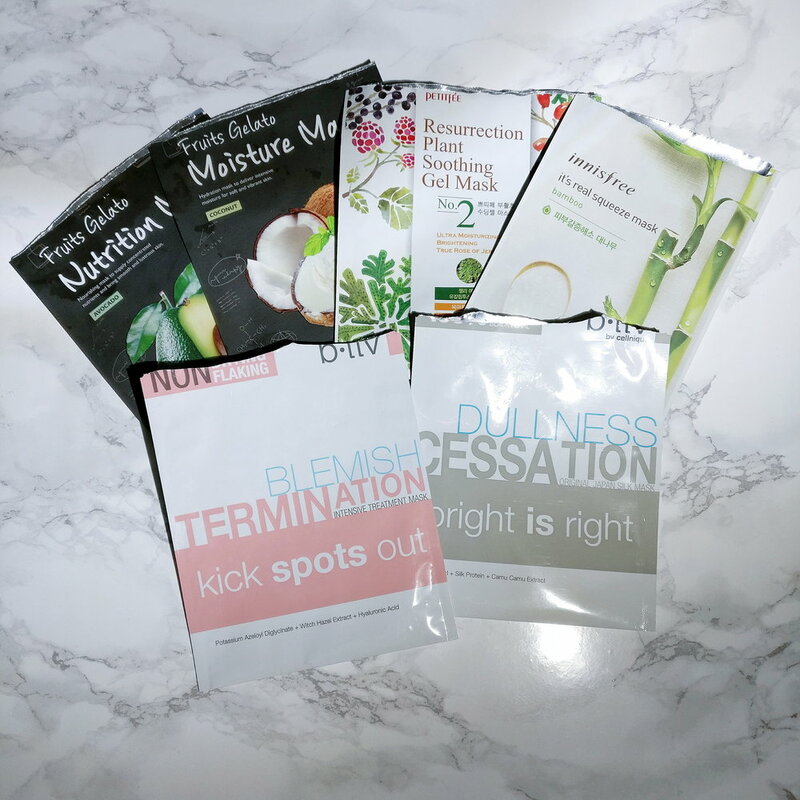 As a sheet mask lover myself, of course I have to join in the #7daysSheetMask game. Having a day job makes it bit more difficult to find the time to be good to your skin and I've mentioned this before, but my skin quality has deteriorated ever since I started a new job. The stress, the commute, then not having enough time in the evening for a full routine... with this challenge I had to make the time for sheet masking and is a good reminder that if you want good skin, you've got to make the time for it, and if it's important enough, you will make the time for it, just like everything else. A picture tells a thousand words and above are the masks I've been using. I thought I would be using the same ones because of how I haven't actually bought a good variety and still have stash left, but turns out that I had some variety. I have also used up all my b.liv masks (woe!) and will need to purchase some more - they're great in terms of product, but the fit of the masks definitely has room for improvement...! Personally, skincare routine is my wind-down ritual. I feel better about myself as a human being after a good skincare routine - makes a huge difference to me when my skin looks and feels great without the congestion and masking helps soothes and relaxes my skin. More often than not though, it's the ritual that puts me at east and relaxes me - being good to yourself has this effect! Skincare is my "being good to myself" and it's the same if you have a different activity/routine you follow. All products have expiration, masks are no different! Granted the expiration may be longer, but you should really be using them regularly for them to not lose efficacy. I have to admit, this was a chance to use up my ancient b.liv masks (which also means I can now buy more...) and to use up some of my other stock, because otherwise it will just sit there and afterall, I bought these for myself to improve my skin. Remember, skin doesn't improve overnight (most of the time), so you need to dedicate products and time, which means they need to be used! That is it for today. Last week has been absolutely hectic so I apologise for not writing a more interesting post. But tell me what your favourite masks are, and if you've tried this 7-day treatment or will try it!